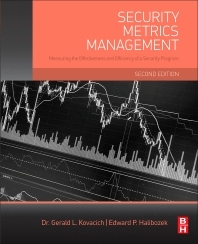 Security Metrics Management, Measuring the Effectiveness and Efficiency of a Security Program, Second Edition details the application of quantitative, statistical, and/or mathematical analyses to measure security functional trends and workload, tracking what each function is doing in terms of level of effort (LOE), costs, and productivity. This fully updated guide is the go-to reference for managing an asset protection program and related security functions through the use of metrics. It supports the security professional’s position on budget matters, helping to justify the cost-effectiveness of security-related decisions to senior management and other key decision-makers. The book is designed to provide easy-to-follow guidance, allowing security professionals to confidently measure the costs of their assets protection program - their security program - as well as its successes and failures. It includes a discussion of how to use the metrics to brief management, build budgets, and provide trend analyses to develop a more efficient and effective asset protection program. What is a Security Metric? What is Security Metrics Management? Is the CAPP Working as Planned? How Can it Be Done Better? How Can it Be Done Cheaper? Edward Halibozek is currently a security consultant and part-time instructor for California State University, Fullerton. He retired from Northrop Grumman Corporation in August, 2011 after more than 26 years with the company. His most recent position was the Vice President of Security. Mr. Halibozek chaired the Northrop Grumman Security Council, which is the company’s key deliberative body for security, contingency planning, investigations and fire services. He was also responsible for Executive Protection services. Mr. Halibozek served as a member of the National Industrial Security Program Policy Advisory Council (NISPAC). Mr. Halibozek holds a Master of Science degree in Criminal Justice from California State University and an MBA from Pepperdine University.